When we started The Bearded Ladies Present - we wanted everything to be streamlined and easily accessible through the web. Anne Marie is in Austin, TX and Allison is in San Diego, CA. How could we possibly review applications on paper? More and more shows are going towards an electronic application - and we wanted to be part of this movement. Well - not everything works out as planned. 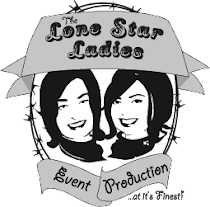 We thought we had the *perfect* application online, and then we started getting error reports... After much trial and error - we have now improved and *hopefully* error-proofed the application for The Bearded Ladies Present: Shop Austin. To apply for our show, first read through all of the show details on our Apply Here Page. You can then move onto the Application, which is now broken down into a three step process. We're looking for artisan based in Central Texas who handcraft fine objects - clothing, handbags, jewelry, kids items, home decor, pet items, gourmet food and more. The Bearded Ladies Present: Shop Austin will be THE shopping event of 2009 - be a part of our show and apply now! If you have any questions or encounter any errors with the application, please Contact Us! E.A.S.T. - come see *annemarie* this weekend!!! E.A.S.T., or The East Austin Studio Tour, is now in its seventh year - and getting bigger and badder every year! This year I am thrilled to announce that I will be participating as an artist. Below are all the juicy details on my personal picks for this weekend! The tour is organized by number - so each studio/artist I list shows their number and a link to their site. There will be white signs all over the East Side with the numbers to help you get around. Anne Marie Beard is a handbag designer and certified fabric junkie. She creates exquisite artisan handbags from vintage and unique materials. Custom cabinets and furniture. This fabulous woodshop is where I work part time - come see samples of the beautiful furniture we make - and have some free beer and snacks! Casey takes beautiful photographs of people and places. She will be showcasing some pictures of her travels and a new work in progress about a fascinating East Austin Diva! Studio 1408 explores surface design, silkscreen printing, textile arts, and mixed media art. Headed up by Kathleen McTee - the fabulous woman behind the Cherrywood Art Fair - this Studio is full of creative talent! They will be having demonstrations all weekend! 45b Lisa Crowder Lisa creates innovative jewelry in a variety of materials including: sterling silver, gold, enamel, ebony & bone. She also has the prettiest curly hair! Amy designs and makes delicious sewn goods - wallets and party purses! She is also hosting Naughty Secretary Club and Hot Pink Pistol for the tour! These gals are new to the Austin Craft Scene - and have made quite an imprint in just a few months. Look for the East End Craft Gallery to be the jumping off point for many up-and-coming Austin designers, crafters and artists! Come on out and see all the fabulous artists this weekend! Remember, the whole tour is free, self-guided, and most places will have free snacks. Support the Austin Arts Community!!! DIY Wednesday: Etsy Austin to host its first event! A couple of months ago I was invited to join the new Etsy Austin team - it's about time we had one here! Etsy, for those of you who don't know - is an easy to use website where crafters and makers can sell their wares. Etsy has gained much acclaim in the past few years - and many major publications are taking note by gleaning the thousands and thousands of cute offerings for their editorial picks. From the NY Times to Lucky Mag - Etsy is bringing crafters into the mainstream mindset. Street teams are groups of Etsy Sellers who organize locally and regionally to promote each other's online shops, produce events and share selling advice. Etsy Austin joins the ranks of the well known Etsy Dallas and Etsy Texas groups - and looks to become a force in the local craft scene. 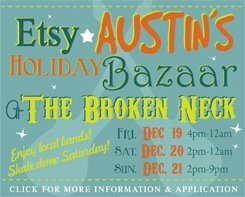 This December Team Etsy Austin will produce their first craft show - a three day affair at the alternative/punk/skater venue The Broken Neck. The event promises to be a fun one - with live music all day and night, and live skating demonstrations. They will feature family-friendly entertainment during the day, and more mature fun for night. The Etsy Austin Holiday Bazaar is currently accepting applications from interested crafters. They also need VOLUNTEERS so check out the details below. And don't forget - my own show, The Bearded Ladies Present: Shop Austin, is currently accepting applications as well! Get yourself set for the FINEST event in Austin next Spring.